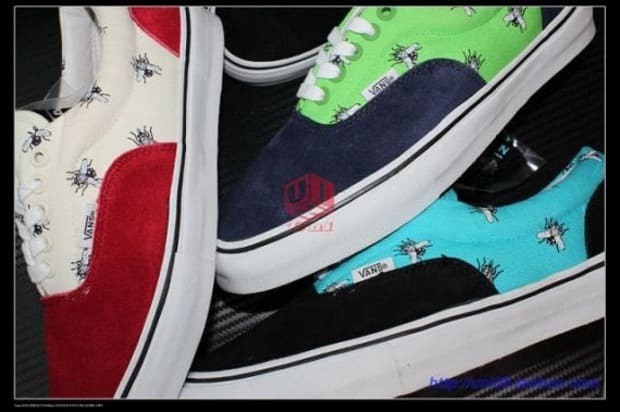 Supreme x Vans Era "Flies"
Probably the longest running collaboration, Supreme and Vans are at it again. Supreme takes one of Vans most beloved silhouettes, the Era and makes it fly by covering it in flies. The Era itself is made up of suede/canvas combo with the canvas portion sporting a repeat pattern of a fly — and if that isn&apos;t enough to make you interested, the Era will be available in three dope colorways of red/white, navy/lime and black/teal. We&apos;re not sure what the exact theme is here, but its definitely an original one. No word on when yet.